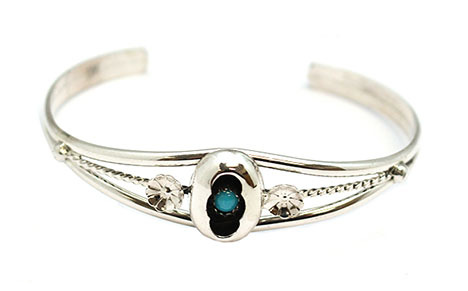 This sterling silver split shank bracelet has an oval shadowbox design with a 4mm turquoise stone in the center and a flower cup on each side. It measures approximately 5/8" wide in the center and tapers down. Crafted by Navajo artisan Della Wyllie.